Add some color to your flower bed this winter by planting some pansies! J&N Feed and Seed has a variety of pansies for you to pick from. Pansies are hardy annuals that are perfect for planting in the fall. They are priced at $19.00 for a flat or 99 cents a piece. 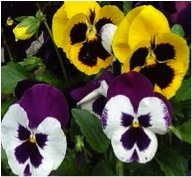 Stop by J&N Feed and Seed today to pick out some beautiful, “smiling” pansies! This entry was posted on Monday, November 3rd, 2014 at 12:17 pm	and is filed under News & Updates. You can follow any responses to this entry through the RSS 2.0 feed. Both comments and pings are currently closed.